Originating from the venerated Maple Leaf Gardens where they served to celebrate great moments within the Leafs organization, we have a collection of four oversized display photos, with each having the desirable added provenance as cherished specimens directly from the collection of Toronto legend Tod Sloan. 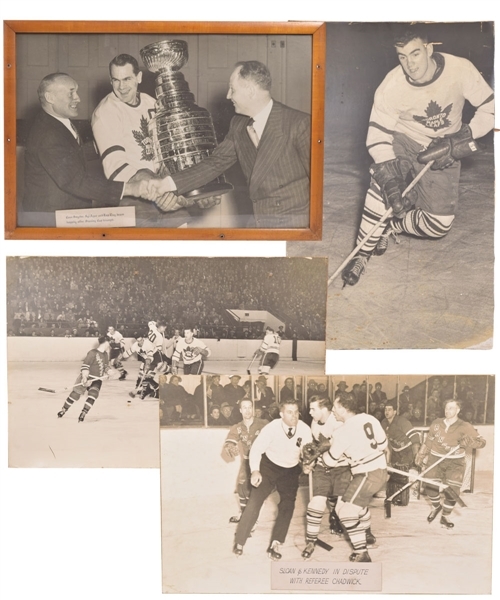 Highlighted by a framed photo of Syl Apps clutching the Stanley Cup while flanked by Hap Day and Conn Smythe, the photo is set in a large wooden frame (22” x 32”) with a small added cardboard plaque listing the particulars. This is followed by a photo of Tod Sloan (23 ½” x 37”), along with a pair that feature game action (20” x 30”), including an example with Sloan and Teeder Kennedy with affixed cardboard plaque. From the famous Maple Leaf Gardens, then the possession of Tod Sloan, and now available to you! An LOA from the Sloan family will accompany. Each photo shows moderate to heavy wear commensurate with both their age and former use, with creasing, toning and some light soiling, with the Sloan example showing especially heavy edge wear. The Apps display most likely hails from the 1947 Cup, as he was only captain for the 1942, 1947 and 1948 victories, and when judging from his appearance along with the fact that the Leafs were wearing blue jerseys upon winning the Cup in 1948, 1947 seems most likely. 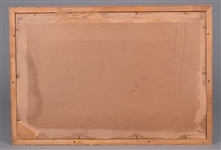 The display exhibits expected wear to the frame including mounting holes, with the small added cardboard listing the particulars loose and dislodged within the frame.